When four dudes find a magical necklace that summons four foxy women looking to have a good time, the sparks fly and the partying begins in this outrageous fantasy comedy co-starring Michael Madsen. A streetwise young man tries to leave his sordid past behind him, but his past returns to haunt him when he meets a small-time drug dealer. A double-dealing member of an elite group of hit men becomes the ultimate target when his organization discovers his deceit. A kickboxing champion is forced to fight cyborgs in a tournament when the company kidnaps his fiancee. Dean Campbell: After tonight, we all start new lives. 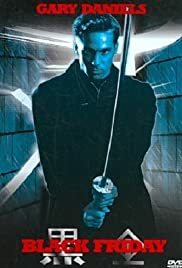 For all you non-fans, stay away, movies like this gives you the inspiration to crash your apartment..
Picture quality: Terrible Sound quality: Terrible Acting: Terrible Effects: Terrible Story: Terrible Fight scenes: Terrible Gary: Wonderful, as always.